On any other day, today's surge in the Turkish Lira would have been sufficient to prompt a sharp rebound in global risk and euphoria across emerging markets as "the Turkey contagion was contained." But not today, for a few main reasons: first, the spike in the Lira was due not to improving fundamentals but as a result of another soft capital control: the local banking regulator announced that the total amount of foreign currency and lira swap and swap-like transactions can’t exceed 25% of banks’ legal shareholder equity (which followed a similar determination at 50% just two days earlier). The logic behind the move, taken straight out of the PBOC's playbook: to "kill offshore lira liquidity to stop foreigners shorting the lira" as Blue Bay's Timothy Ash noted. 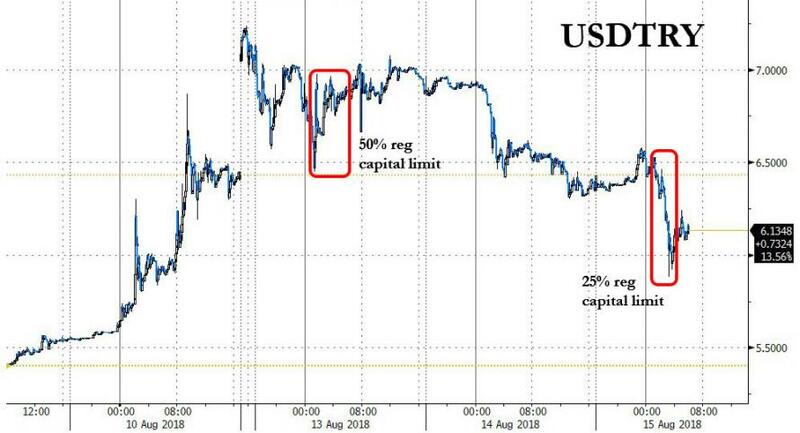 And while the crackdown on shorts worked initially, sending the USDTRY sliding as much as 7% below 6.00, traders are aware that these moves have at beast a very short term impact, and a resumption in the Lira's slide is virtually assured, especially after a Turkish judge rejected a release request from US pastor Brunson while Erdogan announced new tariffs on US imports, guaranteeing that the diplomatic feud with Erdogan will get worse in the next few days. 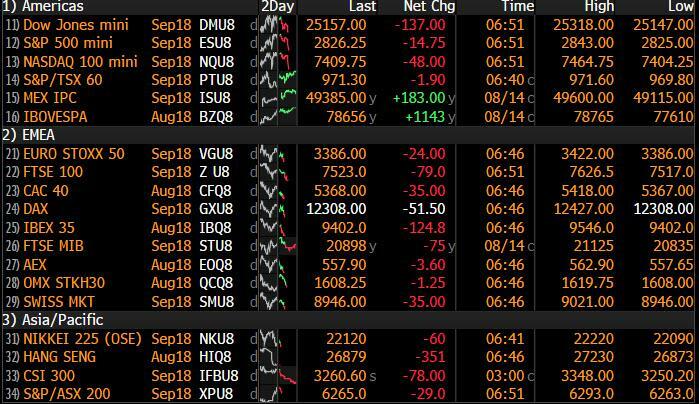 As a result, despite the lira's temporary strength, U.S. equity futures slumped to session lows following declines in both Europe and Asia on Wednesday as risk appetite continued to be tested. Futures on the Dow, Nasdaq and S&P 500 all pointed to a lower open. Treasuries climbed, with the 10Y yields sliding below 2.90%, while the dollar surged to the highest level in 14 months, sucking liquidity out of emerging markets and sending industrial metals sliding: the Bloomberg Dollar Spot Index rose a fifth day, up 0.2% to highest level since June 2017. 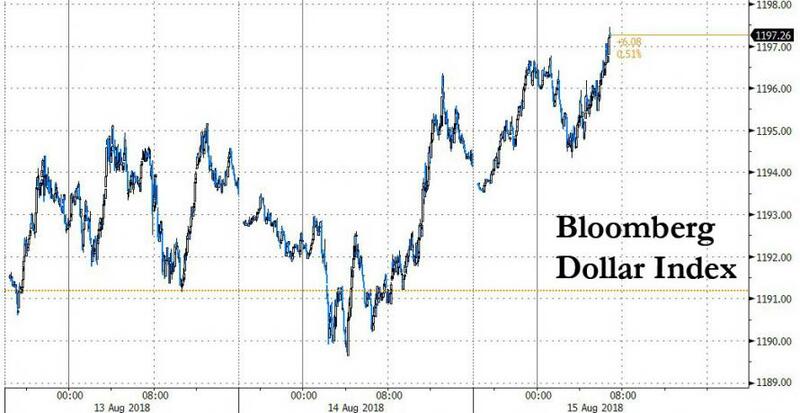 “In light of all the turmoil we’ve seen out of Turkey and the subsequent contagion into other emerging markets, the dollar is pretty much establishing itself as the safe-haven currency,” said Bart Wakabayashi, Tokyo branch manager at State Street Bank. "If you are going to park your money somewhere to stay away from the turmoil, the dollar is going to be the currency of choice." 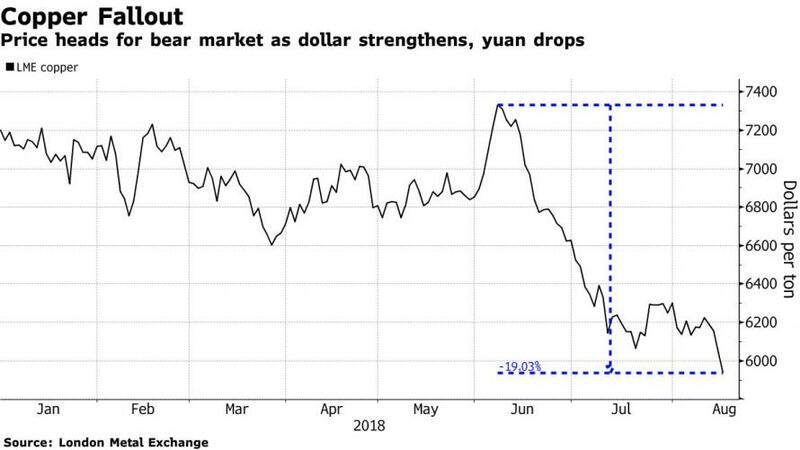 And with the dollar surging, what spooked traders today was not so much Turkey but China, where the Yuan tumbled to new one year lows, with the USDCNH rising above 6.92 while the onshore yuan also fell below 6.900 per dollar, its lowest level since May 2017. Elsewhere, Hong Kong intervened for the second time in three months overnight to defend its peg to the after the local currency fell to the weak end of its trading band. 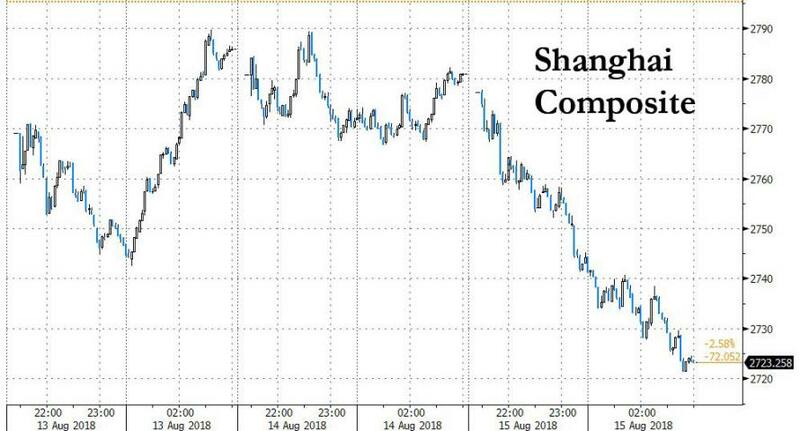 However, with the PBOC refusing to intervene and halt the Yuan's drop, and with traders expecting more trade war retaliation from Trump, the Shanghai Composite was a straight diagonal lower, closing 2.1% lower - down for a 3rd day - and just above the lowest level set for 2018. The strong dollar’s victims are of course emerging currencies, with many remaining under pressure despite the lira’s recent bounce. But the greenback’s rise has also pummelled euro and sterling. There was another key factor in today's EM rout: China's Tencent tumbled after reporting disappointing earnings, missing on both the top and bottom line: Tencent (0700 HK) quarterly net profit of CNY 17.867bln vs. Exp. CNY 19.3bln (Prev. CNY 18.231bln), revenue CNY 73.675bln vs. Exp. CNY 77.7bln (Prev. CNY 56.606bln). And with a weight eight times (4.9%) that of Turkish stocks, this one Chinese company pulled down the EM index. Overall, Asian shares ex-Japan slid more than 1% to one-year lows while MSCI’s all-country equity benchmark was a quarter percent lower but it stayed off one-month lows reached on Monday. After a positive start to the European session, where volumes were muted and liquidity was drained due to the Assumption Day public holiday, raw material producers pulled the Stoxx Europe 600 Index down as industrial metals such as copper and zinc falling to the lowest in more than a year, with copper on the verge of a bear market. As Bloomberg adds, with the US bull market just one week away from becoming the longest in historym investor caution remains amid thin summer trading, and as trade tensions between China and the U.S. linger. Elsewhere in FX, the pound tumbled under $1.27 for the first time since June 2017, having lost ground for 11 days in a row, its longest losing streak since 2008. The currency is being undermined by confusion around what trade deal it (the British government) will negotiate with the European Union ahead of Britain's planned exit next year from the bloc. Price increases were boosted by the cost of auto fuel, transport tickets and computer games. The Aussie and Kiwi were sold against the dollar as liquid proxies to the Turkish lira and South African rand. The yen dropped a second day against the dollar while Japan’s 10- year bond yields edged lower after the central bank refrained from cutting purchases. There was more "evasive action" by various Central Banks and authorities to stem the capital flight, with an ‘unexpected’ Indonesian rate hike - the fourth time since May - accompanied by further measures or verbal pledges to inject liquidity and contain excessive price action/speculative attacks. However, many regional currencies have lost recovery momentum and handed back a chunk of Tuesday’s recovery gains if not more in some cases. Oil fell on inventory increases and as Libya’s output climbed. The crude complex has continued the pullback seen in yesterday’s trade that was exacerbated by a surprise build in API crude inventories, with Brent and WTI breaking though the USD 72/BBL and USD 67/BBL levels to the downside. Taking a look at metals, all of zinc (-2.2%), lead (-1.9%) and gold (-0.5%) are down with the yellow metal below the USD 1190/OZ level, as the rising USD is hitting the metals sector as a whole. Gold, the other traditional safe haven, sank to 18-month lows, also hurt by dollar strength. “The dollar will continue to be the safe-haven asset of preference. 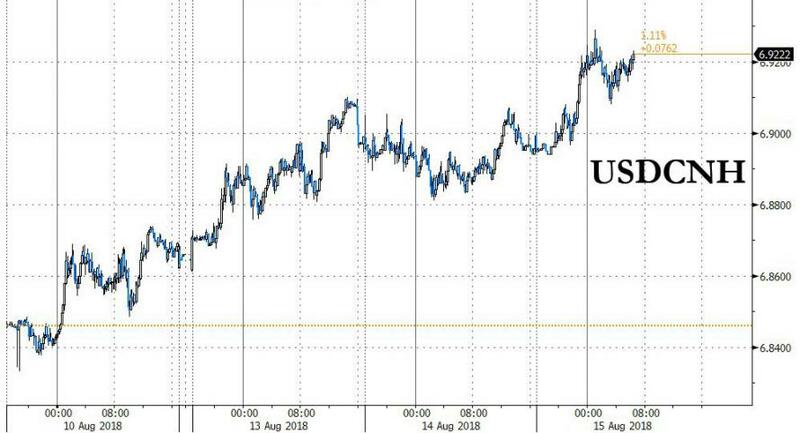 As a consequence, gold prices are really going to struggle,” said Daniel Hynes, an analyst at ANZ Bank. Copper is also down about 2% on the day and has hit a 13 month low, with the construction material hammered by the Escondida copper mine union stopping a strike amid a new contract offer. Economic data include retail sales, industrial output and Empire State manufacturing survey. Cisco, NetApp and Macy’s are due to report earnings. Asian equity markets were mostly negative. Nikkei 225 (-0.7%) weakened amid profit taking following the prior day’s gains of over 2%, while ASX 200 (+0.4%) remained afloat on technical buying as the index reclaimed the 6300 level but with upside capped by losses in financials as Australia’s largest lender CBA suffered on criminal misconduct allegations. Elsewhere, Shanghai Comp. (-2.0%) saw hefty losses and the Hang Seng (-1.5%) declined to its lowest in around a year in a continuation of the recent underperformance as Tencent and tech names remained pressured, while the PBoC skipped reverse repo operations for a 19th consecutive occasion and although it later announced CNY 383bln in 1yr MLF loans, this was still lower than its previous MLF operation of CNY 502bln in late July. Finally, 10yr JGBs were marginally higher with only minimal support seen amid the profit taking seen in Japanese stocks and BoJ’s presence in the market in which the central bank kept its purchase amounts unchanged. PBoC refrained from reverse repos but announced to lend CNY 383bln through 1yr Medium-term Lending Facility. Looking ahead to today, we will get a series of US data releases: July retail sales, industrial production, manufacturing production and capacity utilization data along with August empire manufacturing, and preliminary Q2 nonfarm productivity and unit labor costs, June business inventories and August NAHB housing market index. Macy's will be reporting earnings. President Erdogan and Finance Minister Albayrak gave speeches that doubled down on the confrontational message and gave no indications of a positive resolution to the current political standoff with the US over American pastor Brunson’s house arrest. President Erdogan vowed to boycott American electronics, specifically expressing a desire to ban iPhones in favour of Samsung phones without giving details of when and how. Elsewhere, Turkey’s five-year CDS spreads tightened as well, falling 67.5 basis points, and 10- year sovereign bonds rallied 94 basis points. The strong moves were somewhat surprising, given the lack of concrete policy action by Turkish officials, although an easing of contagion fears, the central bank’s pledge of liquidity if required as well as Reuters reports of a potential conference call on Thursday where Finance Minister Albayrak will seek to reassure investors may have helped too. Broader emerging market currencies performed well in line with the lira yesterday, especially those that had declined in unison over the last few sessions. The South African rand and Argentine peso gained 1.19% and 0.73% against the dollar, respectively. The Mexican peso also gained 1.24%, causing the trade-weighted dollar to close around flat. The DXY index, however, gained 0.35% to the strongest level since June 2017, as developed market currencies depreciated. The yen shed -0.41% but remains in its recent range, but the euro declined -0.58% to its weakest level in over a year and fell below its 200-week moving average. This morning in Asia, the Turkish Lira is resuming its decline (-2.2%) and equities are broadly lower with the Hang Seng (-1.52%), Shanghai Comp. (-1.31%) and Nikkei (-0.85%) all down. Meanwhile, futures on the S&P are marginally lower while yields on UST10y are c2bp lower. As for data, China’s July new home prices grew to the highest in c2 years, up +1.2% mom and +6.6% yoy (vs. 5.8% in June). Elsewhere, Reuters cited an unnamed White House official who warned more economic pressure may be placed on Turkey if it refuses to release the American pastor. Back to yesterday, the dollar’s recent strength is weighing on commodity prices. Brent crude oil failed to rally again yesterday, paring intraday gains of as much as 1.82% after news broke that India may cut oil imports from Iran by 50% to satisfy a US waiver. Countries like India are potentially the swing purchasers for Iranian oil; if they decide to follow US sanctions it will likely remove Iranian oil from the global market. The broader commodity complex was lower as well, with the bellwether CRB raw industrials index dipping to its lowest level of the year. 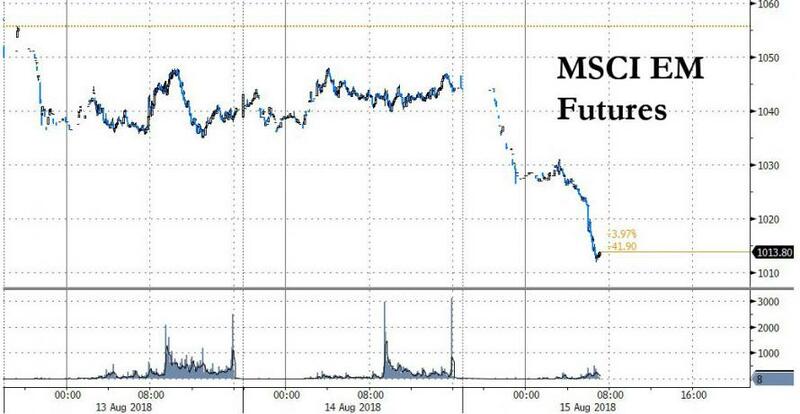 Front month copper futures fell 1.78% to their lowest level since last July. In the US, risk sentiment improved and the S&P 500 posted its first gain in the last five trading session, rising +0.64%. Banks led gains, rallying +1.04%, but they nevertheless remain -0.38% lower since their level before Turkey-related volatility intensified on Friday. Similarly, the VIX index fell 1.5 points but remains 2.4 points higher over the last week. Sectorally, cyclical sectors outperformed, with consumer discretionaries rallying 0.95% and utilities lagging behind. Treasuries sold off slightly but the 10-year yield ended the session broadly flat. European equities failed to join the global rally yesterday, with the Euro Stoxx 600 closing flat. The weaker euro did not provide a tailwind, with the correlation between the single currency and the Stoxx 600 recently turning positive for the first time since last summer. Usually, a weaker euro boosts European exporters and increases the value of overseas earnings. Fixed income price action was firmer, with the IG and XO iTraxx indexes rallying 0.9bp and 2.4bp, respectively. German bund yields sold off slightly, in line with Treasuries, but peripheral spreads rallied notably. Italian two- and ten-year spreads to Germany closed 9 and 8.7 basis points tighter, respectively. This partially reflects the improved price action out of Turkey, but could be in response to more positive developments surrounding the upcoming Italian budget. Ansa reported that Prime Minister Conte and top ministers agreed that they will need to cut the debt stock moving forward. Staying with Italy, ANSA also has reported that a 50-year old suspension bridge in Northern Italy has collapsed and led to at least 26 casualties. Following on, the Deputy Premier Salvini has signalled that EU rules should not hold back investments as he noted “there can be no trade-off between fiscal rules and the safety of Italians” while adding that “if external constraints prevent us from spending to have safe roads…then it really calls into question whether it makes sense to follow those rules”. Moving onto Brexit where the German Chancellor Merkel may be suggesting a more flexible approach to Brexit talks. She noted that “hopefully it’ll not come to an unregulated Brexit, but rather to a reasonable negotiated agreement”, although she added that the UK has to “commit to re-accepting EU rules”. Earlier on, the UK Foreign Secretary Hunt noted that “we need a change in approach by the EC if we’re going to have a pragmatic deal that works for everyone”. Before we take a look at today’s calendar, we wrap up with other data releases from yesterday. In the US, the July NFIB small business optimism index nudged up 0.7pts mom to a fresh 35 year high (107.9 vs. 106.8 expected). Respondents were more optimistic about the general economy, hiring and prospects for employee compensation. In Europe, Germany’s 2Q GDP was above market at 0.5% qoq (vs. 0.4% expected), while prior data revisions have led to an annual growth of 2.0% yoy (vs. 2.1% expected). The German statistical office indicated that consumption and investment had contributed positively. Elsewhere, the second reading of the Euro area’s 2Q GDP was revised 0.1ppt higher to 0.4% qoq and 2.2% yoy, while the final reading of Germany and France’s July CPI was confirmed at 2.1% and 2.6%, respectively. Meanwhile, the August ZEW survey indicated respondents were less pessimistic this month, with the expectations index for Germany (-13.7 vs. -21.3 expected) and the Euro area (-11.1 vs. -18.7 previous) both improving and now at the highest levels since May. Back in the UK, the June unemployment rate fell to a 43-year low, down 0.2ppt mom to 4.0% (vs. 4.2% expected) while the employment change was below market at 42k in 2Q (vs. 93k expected). Lastly, the average weekly earnings growth (ex-bonus) nudged down one tenth to an inline print of 2.7% yoy.